A legislative committee has amended a bill to replace Maine's state flag to direct the secretary of state to come up with a design for the state's bicentennial flag. 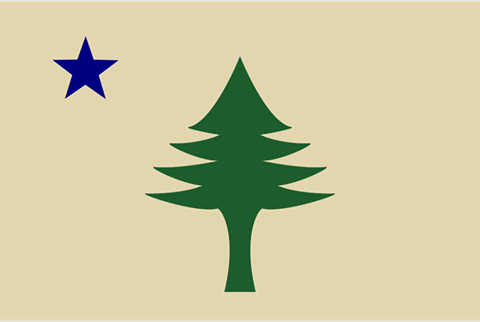 The proposed legislation before the State and Local Government Committee would bring back a flag from 1901, a simple design that features a pine tree and a star. The committee decided to amend the bill to direct the secretary of state to come up with a bicentennial flag, but gave no recommendation. Some on the committee said they believe the state should have a flag connected with its bicentennial, but do not want to end the use of the current official state flag, adopted in 1909. Rep. Janice Cooper, a Democrat from Yarmouth and sponsor of the bill, says she’s OK with the committee’s handling of the bill, but still believes there is broad public support for the 1901 flag. “People go to these flag makers because they want the flag. They have heard about one way or another. They have seen images of it. And they just like it,” she says. Opponents of the legislation say the public wants lawmakers to work on serious issues rather than debating a new state flag or a state bird.